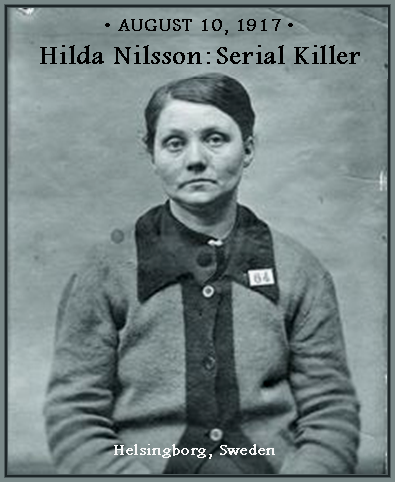 Hilda Nilsson may still hold the title of Sweden’s worst female serial killer. The news reporters referred to her as an “angel-maker” because she murdered at least eight children in and around Helsingborg, where she earned a living caring for children of unwed mothers. Nilsson’s sordid story also involves a haunting that looms over the historic Landskrona Citadel, a fortress built in the 1500's that was used as Nilsson’s cell after she was convicted for the killing of the children in 1917. She hung herself in the cell rather than face the guillotine. It is said that her ghostly spirit still haunts the place. As Nilsson’s story is told, she and her husband, Gustav, found themselves deep in debt so Hilda began caring for children to raise extra money. She specialized in taking care of children of unwed mothers at a time when having children outside of marriage was considered a moral crime. Secret “baby farming” then was a common practice. In many cases, the mothers paid a fee, dropped off their babies and never came back. Nilsson got away with her crimes for a long time because the mothers usually didn’t learn what happened to the children. And since they were delivered secretly, there was no record of their existence. For a while it was a perfect crime. It was said that Nilsson usually killed the babies as soon as they were left in her care. Her method was putting them in a washtub, placing a heavy object on top of them, and letting them drown. She burned or buried the bodies to dispose of them. Authorities caught up with Nilsson because one mother, Blenda Henricsson, returned for her baby. When Nilsson refused to allow her to see the child, Henricsson contacted the police. It did not take long before the police found evidence of the murders. Nilsson was arrested, tried and found guilty of killing eight children. Some say they believe she murdered as many as 17 babies before she was caught. She was sentenced to death by guillotine. It is ironic, perhaps, that on the very day Nilsson committed suicide the court commuted her death sentence to life imprisonment. She never knew it. She was the last death penalty prisoner in Swedish history not to be pardoned. She died before the pardon could be made official. People in Helsingborg have told stories for years of seeing Nilsson’s haunted spirit floating around in the house where she committed the murders. Eventually the house was demolished because no one wanted to live in it. Cell 5 in the old fortress also was considered haunted. The story is told that a Danish prostitute who was locked in the cell went insane. They found her in a crazed state the following morning. On the floor was a blood stain that looked like the “devil’s eye” that the woman said dripped from Hilda Nilsson’s thumbed Bible. Another woman locked in the same cell said she saw a woman hanging in the window. Jailers told of hearing mysterious noises coming from Cell 5, and dogs refused to enter the cell. The Citadel is mostly preserved as a museum today. It was not used for housing women prisoners after the 1940s.